You are never too old for a carousel! Everyone loves a carousel. Our residents who are in the 80’s and 90’s had as much enthusiasm and vigor as any child. Each summer, we take our annual visit to Nantasket Beach. The past summer we stopped at the Paragon Carousel. 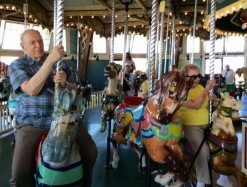 The Carousel has been operating along the shores of beautiful Nantasket Beach for more than 80 years. Interestingly enough our residents were most amazed by detailed craftsmanship of the carousel. And all thought it was beautiful. In October, Springhouse Senior Living sponsored a three part special presentation Now is the time to learn more about memory care. 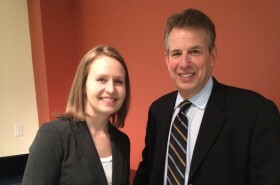 Dr. Elizabeth Vassey and Dr. Paul Solomon (pictured left) and Dr Robert Stern (not pictured) presented on the topics: How to recognize the early symptoms of memory loss; Driving: Transitioning from the driver’s seat to the passenger seat, and Saving 6 million lives: The Alzheimer’s vaccine and other new treatments. Springhouse is proud to have such a wonderful relationship with the Museum of Fine Arts (MFA) Boston. Springhouse takes part in the Access to Art Program which provides free guided tours, as well as wheelchairs, walkers and assistive listening devices for seniors and those with a disability. 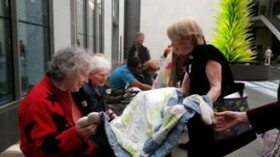 Our Assisted Living and Allen House residents make regular visits to the MFA through this program. Our very own Meredith Griffiths, Therapeutic Program Coordinator serves on the Access Advisory Board at the Museum of Fine Arts. Together, this board works to help the Museum support elderly and disabled visitors. Springhouse Senior Living welcomed Former Governor Michael Dukakis on Tuesday, July 9, 2013. The Dukakis family holds a special place within Springhouse. 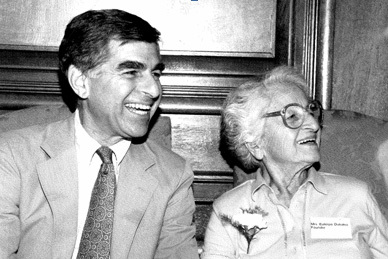 We were fortunate enough to have Euterpe Dukakis, mother of Governor Michael Dukakis as wel as Harry Ellis Dickson, mother of Kitty Dukakis as residents of Springhouse in the early years. For several years, Springhouse has guided Master’s level student interns from Lesley University’s Expressive Therapies and Mental Health Counseling Program. This year we welcomed Erica Curcio who is in her first internship and second year of the Expressive Therapies program at Lesley where she studies Art Therapy. 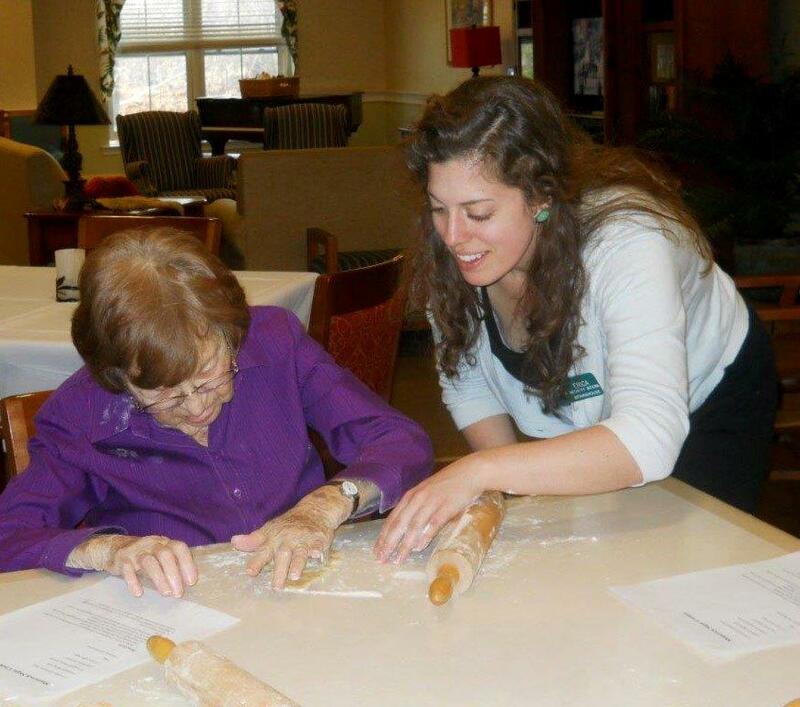 Two days a week Erica brings specialized expressive therapy groups to the residents of Springhouse and also meets with residents on an individual basis. 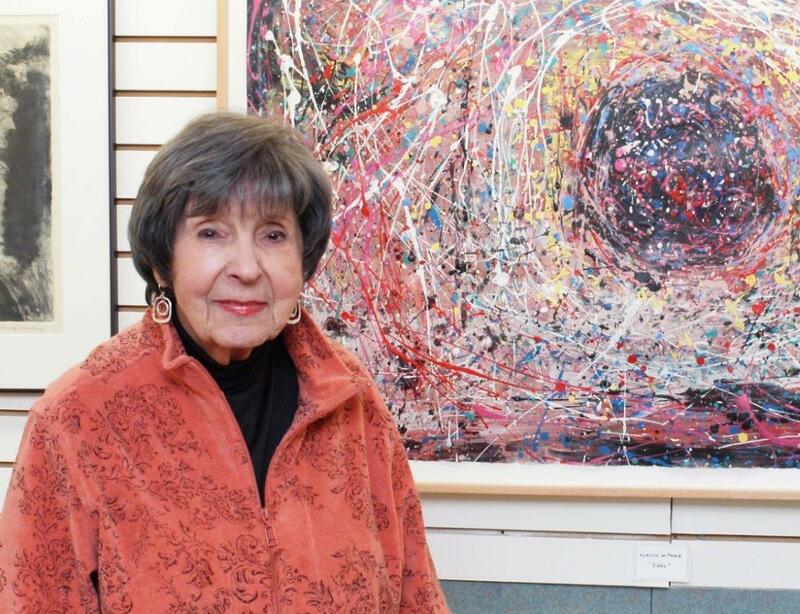 The Springhouse Art Gallery typically seeks out artists from the greater Boston community. The exhibits are on display for 6 weeks at a time. When the art committee was looking for the next exhibit they had to look no further than amongst themselves to find the very talented Marilyn Wasserman. On March 28, Springhouse Senior Living welcomed Amy Schram, from the Better Business Bureau Senior Awareness Program. Amy discussed with us how seniors can better protect themselves from scams, how to give wisely to charities and what are the recommended Better Business Bureau standards of trust. The goal of the BBB’s Senior Awareness Program is to educate seniors about ways to recognize and avoid common scams and ways to avoid becoming victims of consumer fraud. Consumer fraud is when consumers lose money due to illegal practices when con artists profit. Other fraud may involve deception and sales tactics which mislead or pressure consumers into buying goods or services which they don’t really need. “Knitting is something you just don’t forget.” Those are the words of Ann Winslow, a resident of Springhouse for the past 16 years. She has been knitting since she was a child and also made a lot of her own clothes and her children’s clothing. 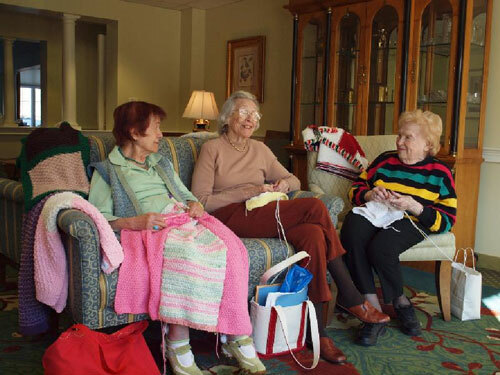 Knitting is a hobby of Ann’s, but it is also a charitable outlet for her and many other women at Springhouse. For about ten years now, a group of knitters at Springhouse have been a part of “Project Linus” a national organization providing comfort for children who are seriously ill, traumatized or otherwise in need, by giving them hand-made knitted blankets. Over 4 million blankets have been donated through this charity, which currently has 368 chapters nationwide. The women at Springhouse are part of the Greater Boston Chapter and together they have knitted and donated over 200 blankets to Project Linus. 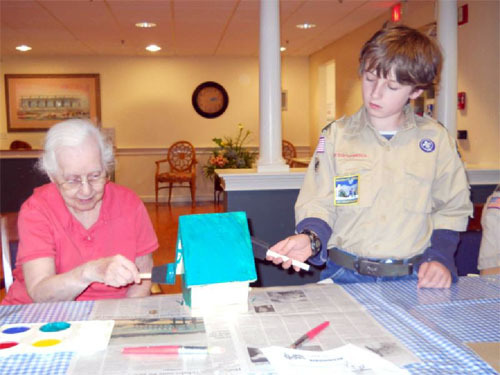 The Brookline Boy Scouts Troop 6 spent a Sunday afternoon this spring assembling and decorating birdhouses with Springhouse residents. Residents lent a helping hand, holding the wood while the scouts hammered the nails into place. Together they then decorated these one-of-a-kind birdhouses. Our assisted living activities coordinator, Sheila Caccavaro, offers a training program to independent and assisted living residents. This monitored program helps residents work on their range of motion and gradual strength building with several pieces of Nautilus equipment that target specific muscle groups.